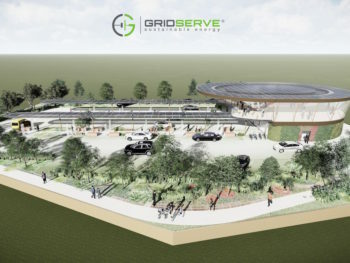 Global energy business Gridserve is to roll out a UK-wide network of more than 100 ‘Electric Forecourts’ to bring low-cost, ultra-fast charging, backed by renewable energy and a convenient, driver-focused charging experience. Construction will start on the first sites this year, with the locations for the first 80 Electric Forecourts already secured based on their proximity to grid connections close to towns, cities, and major transport hubs, including York and Hull. The sites will be powered by new solar farms, also being built by Gridserve, and multi-megawatt batteries under a £1bn programme promoted to global investors by the Government under the UK’s first Energy Investment Portfolio. Gridserve is also developing several large solar farms, supported by batteries, to supply energy via the grid for the remaining sites. As well as offering clean energy, the solar farm and battery set-up will generate profits by providing services to National Grid. All of this will help ensure low costs of charging that will be competitive with home and destination charging costs, according to the firm, to help ensure EVs are cheap to run. The network, designed in partnership with Arup, will also centre on offering convenient, customer-focused facilities like those seen in service stations. Each Electric Forecourt will have dedicated zones for both private and fleet vehicles, such as taxis, buses, delivery vehicles and heavy goods vehicles. Chargers – which are being supplied by ChargePoint – will have an ultimate rate of 500kW for cars and light commercial vehicles and there will also be multi-MW charging options for buses and heavy goods vehicles. Typical configuration includes up to 24 ultra-fast charging bays, with batteries to support the maximum power requirements of all chargers simultaneously. A new queuing system will also minimise waiting times, and allow customers to be able to reserve charging slots in advance. Meanwhile drivers will get access to a range of facilities including a coffee shop, fresh food, convenience supermarket, and airport-style lounge with high-speed internet, which will also serve as an education centre and hub to explore a broad range of electric vehicle solutions. Gridserve is also developing an app to help with EV journey planning, reservation of charging slots and to pay for ancillary on-site services such as car washing. The app will also be used to underpin loyalty and referral schemes that will reward people with Road Miles for using onsite services provided by Gridserve and its partners. Toddington Harper, CEO and founder of Gridserve, said: “We plan to make charging electric vehicles as easy as using petrol stations. The latest generation of electric vehicles are awesome, and ready for mainstream adoption, but drivers still worry about if or where they can charge, how long it will take, and what it will cost. We plan to eliminate any range or charging anxiety by building a UK-wide network of customer-focused, brand new Electric Forecourts that will make it easier and cheaper to use an electric vehicle than a petrol or diesel alternative.